As the one year anniversary of Barack Obama's inauguration nears, it is a metaphysical certitude his fawning media will look back upon the past 365 days with the starry-eyed impartiality of a teenybopper in the presence of a rock star. Before the President's fans in the press embarrass themselves, maybe they should take a cue from comedian Jon Stewart who on Thursday exposed numerous campaign promises the former junior senator from Illinois has broken that have not surprisingly missed the scrutiny of those supposedly in the business of disseminating "real" news to the public. JON STEWART, HOST: Peter Orszag isn't the only one in Washington getting busy. After their last minute Christmas Eve vote to pass healthcare, the Senate returns to the hill to reconcile their version of the healthcare bill with the bill previously passed by our House of Representatives. You know what that means open government fans? This is the moment we've been promised. PRESIDENTIAL CANDIDATE BARACK OBAMA: When we are negotiating for that plan, we're going to have C-SPAN on and you will see who is compromising the American people's interest. This will all be televised on C-SPAN. Broadcasting those negotiations on C-SPAN. I'm going to do it on C-SPAN. On C-SPAN. On C-SPAN. STEWART: Senior political analyst Samantha Bee joins with us more. Sam, this looks and sounds pretty bad for Obama. SAMANTHA BEE: Well, only if you are watching and listening, Jon. This has been a real problem for the President. STEWART: Because he is now being held accountable for his promises? BEE: No, because he made promises he could be held accountable for. Listen, it's fine to pledge transparency and openness, subjective concepts, but for God's sake don't start telling people what channel they can go watch it on. You're just setting yourself up. STEWART: You are saying that politicians then in your mind should never emphatically promise anything. 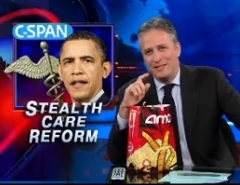 STEWART: But Sam, this gets back to the kind of campaign that Obama chose to run. It was an unknown quantity and there was pressure on him to give specifics to what he was proposing. PRESIDENTIAL CANDIDATE BARACK OBAMA: We will give tax breaks to American businesses that are creating jobs right here in the United States. A $3,000 tax credit for every job. We'll let Medicare negotiate for lower prices. We can get our troops out, our combat troops out within 16 months. I'll eliminate income taxes for seniors who are making under $50,000 a year. I will end don't ask don't tell. We'll allow the safe re-importation of low-cost drugs from countries like Canada. PRESIDENT OBAMA: Guantanamo will be closed no later than one year from now. BEE: Two weeks to go. But I'm sure no one will make a big deal when he misses the deadline. STEWART: You know, he hasn't fulfilled not one of those that we showed. What sorts of things should he be saying? BEE: I promise to uphold the traditions that have kept our country safe, a treasure you can't put a price tag on. STEWART: Samantha Bee, everybody. We'll be right back. As the one year anniversary celebrations kick off in the coming days, will "real" news outlets be as honest about the President's first 365 days?